Dr John Davis: Visiting Lecturer in Biotechnology, University of Hertfordshire, previously Senior Project Scientist at Bio Products Laboratory, UK. 1 The Cell Culture Laboratory (Sue Clarke and Janette Dillon). 2 Sterilization (Peter L. Roberts). 3 Microscopy of Living Cells (Colin Gray and Daniel Zicha). 4 Basic Techniques and Media, the Maintenance of Cell Lines, and Safety (John M. Davis). 5 Development and Optimization of Serum- and Protein-free Culture Media (Stephen F. Gorfien and David W. Jayme). 6 Cryopreservation and Banking of Cell Lines (Glyn N. Stacey, Ross Hawkins and Roland A. Fleck). 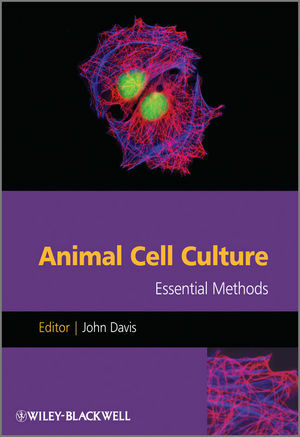 7 Primary Culture of Specific Cell Types and the Establishment of Cell Lines (Kee Woei Ng, Mohan Chothirakottu Abraham, David Tai Wei Leong, Chris Morris and Jan-Thorsten Schantz). 8 Cloning (John Clarke, Alison Porter and John M. Davis). 9 The Quality Control of Animal Cell Lines and the Prevention, Detection and Cure of Contamination (Peter Thraves and Cathy Rowe). 10 Systems for Cell Culture Scale-up (Jennifer Halsall and John M. Davis). 11 Good Laboratory Practice in the Cell Culture Laboratory (Barbara Orton).